RUDN medics report that exposure to organotin compounds may cause metabolic disturbance and therefore lead to obesity. Being aware of the mechanisms of such exposure, doctors can neutralize the effect of the toxins. The work was published in the Journal of Inorganic Biochemistry. For a long time, obesity has been considered the result of excess calories due to overeating or lack of exercise. However, in the 2000s, scientists found a correlation between obesity and exposure to environmental toxins. The correlation exists for many organic substances and for a number of metals such as cadmium and mercury. A team from the department of medical elementology at RUDN supervised by the department's head Prof. A.V. Skalny and working together with an international group of colleagues from Norway, USA, and Poland found the role of organotin compounds in the development of obesity. Organotins combine the properties of metals and organic substances and are used as an anti-corrosion agent on ship hulls, among other things. "Seawater has the highest concentration of organotins, and therefore their accumulation in the body is directly associated with fish and seafood consumption," said Alexey Tinkov, a candidate of medicine, a senior lector at the department of elementology, RUDN, and a co-author of the study. The team analyzed earlier works on the biological effects of organotins. "Data on the examination of human patients is very scarce. The majority of work was carried out in cell cultures and lab animals," explained Alexey Tinkov. "In our work, we raised awareness about this issue in people." RUDN scientists carried out a clinical study in 2014 in which they measured the levels of toxic elements in people with different body weights and registered increased tin concentration in the hair of obese patients. 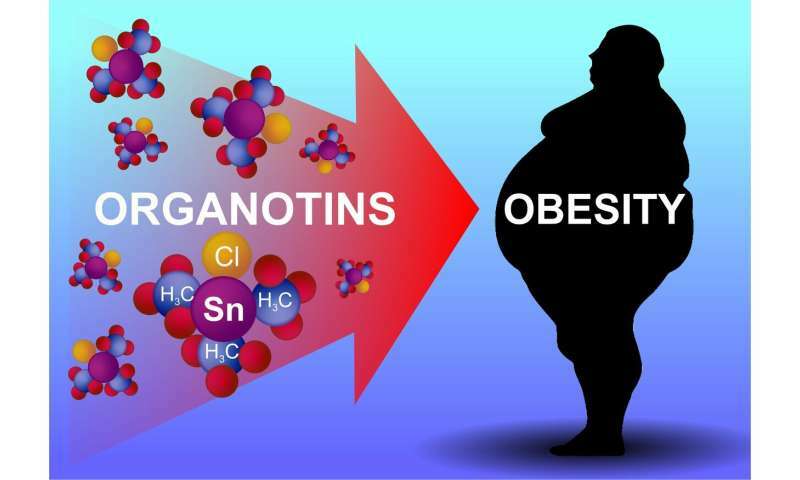 The team identified several mechanisms of toxic influence of organotins leading to obesity. One of them affects two types of receptors in cell nuclei—those activated by the proliferator peroxis (PPARs) and the retinoid X-receptor α (RXRα). They regulate the metabolism of carbohydrates and fats, and organotin compounds may cause their excessive stimulation and therefore disturb it. Organotins can also affect the central nervous system and generate signals that increase the appetite. "The eating control center of the brain processes two types of signals—those stimulating the appetite and suppressing it. There should be balance between them," said Tinkov. "Organotins turned out to shift this balance in favor of the first type. Therefore, the appetite increases and the food intake grows." There are other ways in which organotins can affect obesity—e.g., through the activation of the estrogen receptor, disruption of DNA methylation, and changing the microbiome of the intestines. Currently, the scientists are unable to say which plays a more important role in metabolic disturbance, as this question requires additional studies. "The biological effects of organotins are explained by the physical and chemical properties of these compounds and their specific reactions with biological ligands," said Olga Aysuvakova, another co-author of the work, a candidate of chemistry, and a senior lector at the department of elementology, RUDN.